Our run of ” The Man from Earth” is over, the last pieces of the set have been removed from the theatre and there’s very little left to do to close it out. Thanks to everyone who participated and especially to the audiences who made it a success! We’re back to a normal workshop schedule from this Tuesday – do come along7.45 in Synge St. CBS. 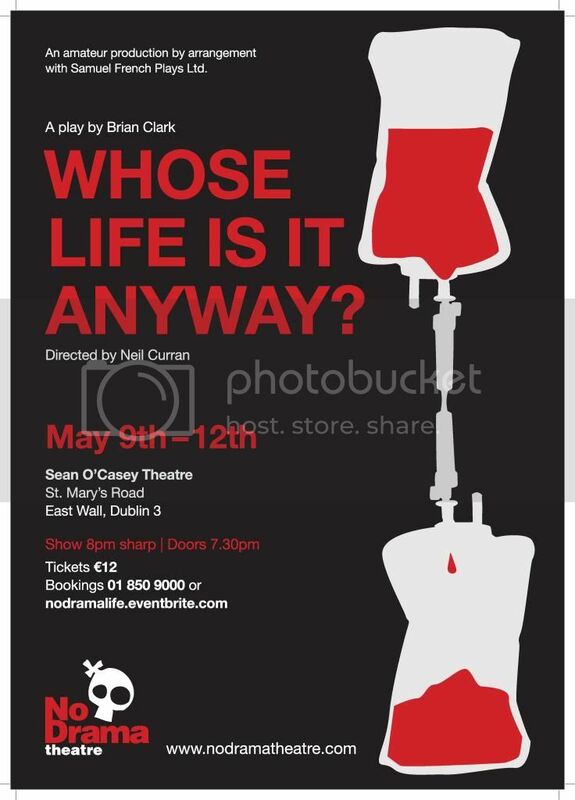 No Drama Theatre will present ‘Whose Life Is It Anyway’, a play that explores the controversial issue of euthanasia, from May 9th – 12th at the Sean O’Casey Theatre, East Wall, Dublin 3. In Ireland, it is illegal for a doctor (or anyone) to actively contribute to someone’s death. It is not, however, illegal to remove life support and other treatment (the “right to die”) should a person (or their next of kin) request it – in other words, passive euthanasia is legal. Voluntary euthanasia is legal in a small number of countries in Europe, including Belgium and the Netherlands, where the process is physician-assisted. In Switzerland, assisted suicide is permitted and is the only country that will allow non-residents access to these services. #whoselifeBrian ClarkeWhose Life Is It Anyway? A prisoner who can walk through walls…. Could this really be the second coming of Christ? Could we really crucify again? so Arthur Miller’s Resurrection Blues is strangely relevant in Ireland 2011. Have we learned anything in over 2,000 years? By arrangement with Josef Weinberger Plays Ltd.
Ladies and Gentlemen, it’s the moment you have all been waiting for. We are thrilled to announce the cast of the next No Drama Theatre’s production , Irvine Welsh’s Ecstasy adapted by Keith Wyatt. We wish them all the very breast of duck and extend our most gracious thanks to all those who took the time to audition! Apologies for the lack of updates here folks, we’ve been incredibly busy trying to pick plays and hunting for directors and generally being so up to our eyeballs we’ve not been able to keep up. We’ve got a couple of big announcements which have been posted elsewhere but we include here for completeness! After a very difficult review process the next production has been announced and audition notices sent out. (Intandem attached to Irvine Welsh’s Ecstasy). 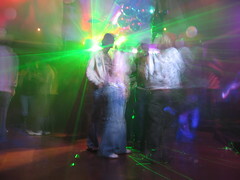 The Director has also been chosen for Ecstasy, Dave McGowan who will be documenting his experiences on this blog. If you’re interesting in performing you can post a comment below and we’ll contact you with details. expect a follow up post on how else you can get involved. John Cremer Guest appearance at Laughalot! LAUGHALOT IMPROV is honoured to be joined by improvisation legend JOHN CREMER (all the way from the UK) for one night only this Thursday March 10th. Founder of Brighton’s multi-award winning comedy improv. group ‘The Maydays’ and Fellow of ‘The Professional Speakers Association’, John Cremer is not only renowned for performing and teaching comedy improvisation, he’s even published books on it! LAUGHALOT IMPROV. (No Drama Theatre’s Comedy Improv. Team) were invited to perform at this year’s Tedfest, the annual Father Ted festival held on the Aran Islands. This is the first year that the festival will feature improv. and in keeping with the spirit of the festival the group were be billed as “The Unscriptured”. Neil Curran,Maria Dillon,Ruari DeBurca and Declan Ryan did NoDrama Proud as did Alan Rogers who while not technically performing became a minor celebrity as Fr. Darth Vader while on the island. 3rd – 6th November, 7:30PM. Teachers’ Club, 36 Parnell Square West. A funfair for Pratchett fans. Come dressed as your favourite Discworld character to join us in the magic. ‘Terry Pratchett ’ and ‘Discworld’ are registered trademarks. Electric Picnic Show ——— Back On! Unfortunately ‘Love, Hate, Whatever’ will not be perfomed at Electric picnic as advertised. We have had word this morning from the organisers that they have had to cut a number of acts from the Theatre tent for organisational reasons. While this is sad news, rest assured that we will arrange a public performance of Love, Hate, Whatever in the near future as soon as we can arrange a venue. Watch this space. Forget what we said, We’ve just recieved confirmation from Electric Picnic organisers to say the Show Will Go On! No Drama is delighted to call to auditions for it’s next production: Terry Pratchett’s ‘Wyrd Sisters’ [subject to license]. These will take place next Tuesday, August 24th at our usual home, Synge St Boys CBS, from 6pm – 10pm. Everybody interested in auditioning and who is also a full member* of No Drama Theatre then email wyrdsistersnodrama@gmail.com to book your audition, receive the audition sheets and all other Wyrd related information. Call backs will be on Wednesday, August 25th. If you can’t make it Tuesday, there will be some audition slots available before or after Monday’s workshop (the 23rd) but you must let us know by Sunday evening if you need to avail of them. Rehearsals start next Sunday, August 29th and will run 2-3 days a week (between weekdays and weekends) until the productions starts on November 3rd – 6th. Potential cast must be available for the entire rehearsal schedule.